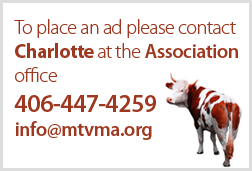 MVMA Members may post relief services or requests on this page at no charge by emailing Charlotte the posting: [email protected]. The posting will remain up for 3 months. Please click here for non-member pricing. Relief or part-time veterinarian needed for a predominantly small animal practice in Bozeman beginning mid-May 2019. Please send resume to [email protected]. Looking for a relief doctor any days from July 1 - 6 (closed July 4th) at Cats On Broadway Veterinary Hospital in Missoula. Please contact Jenny at [email protected]. Seeking relief veterinarian for periods over June - September 2019. May be able to arrange housing if needed or desired. Please contact Amy at [email protected] or 406-585-7387. Dr. Meg Puchlerz - Experienced small animal practitioner. I am a dedicated relief/locum veterinarian. I strive to provide my locum hospitals with the highest care and client communication possible. You will return to your hospital to find all notes completed and any challenging cases personally transferred/discussed with you. Serving Western Montana, Alaska and Oregon. Other locations considered on request. Please call, text or email for availability. Now taking coverage reservations for 2019.